A friend brought his guitar to me to fix. 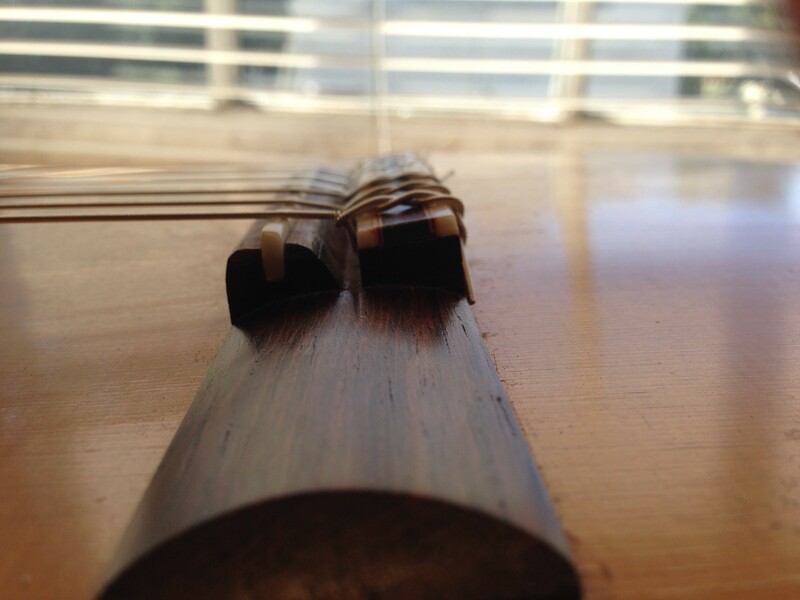 The most serious problem was the action… about 1.6 mm too high at the 12th fret for both the bass and treble E strings. The cause: the neck had pulled up a bit, the top had bulged. Here is a picture before I started working on it. 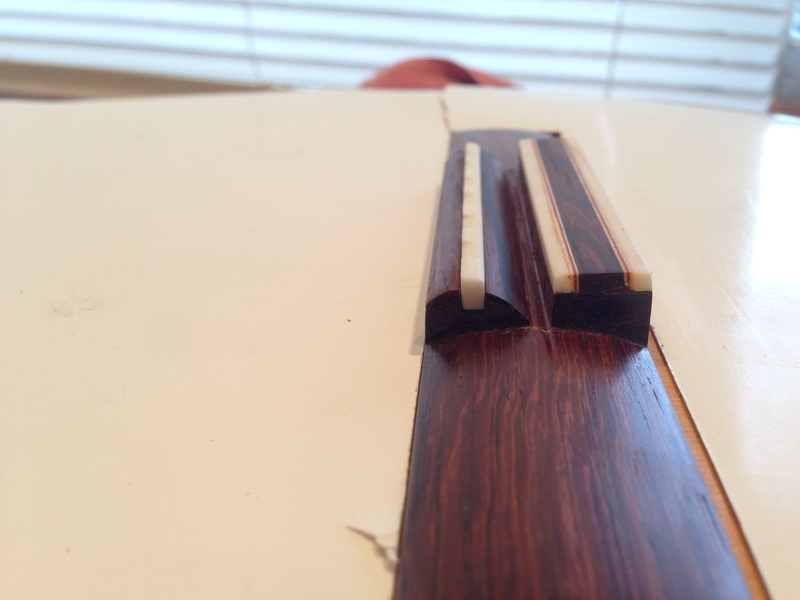 The situation was so bad that I thought I would have to replace the fingerboard. A long, tedious and risky job. Instead I re-measured and found that I could change the bridge. First I made an extra hole for each string so that the tie loop would not pull up the string. The original holes were nice and low. However the tie block itself is beefy, and as I explained above, the action had changed, pulling the strings higher above the fretboard and even above the bone saddle! That presents a problem. The strings need to lowered at the saddle but the bridge itself was higher than the strings needed to be. 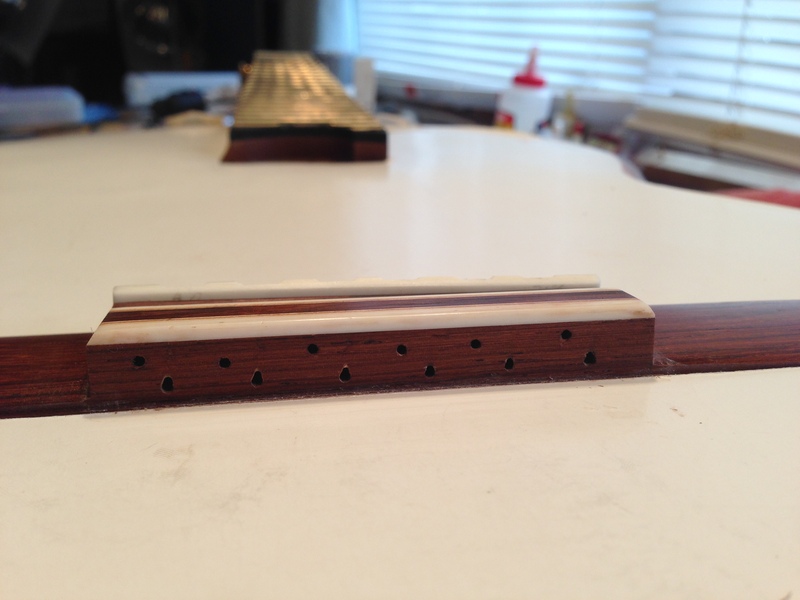 The extra holes enable the strings to exit the tie block and go over the saddle without being pulled up by the wrap. 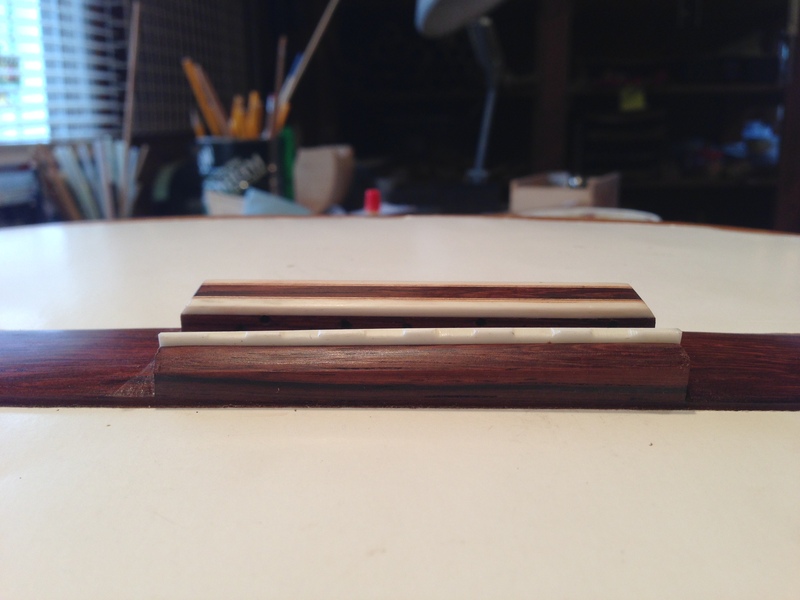 That’s why I decided to reshape the bridge in addition to the extra holes. Now that the strings could exit the holes, the action could be lowered. However the part of the bridge that holds the saddle was too high to lower the saddle! Reshaping that part of the bridge would enable lowering the strings. Below you can see the re-shaped saddle support. Compare it to the first picture in this post. I also made a new saddle, which fit into the slot tightly. The last picture shows newly shaped bridge from the front with the new saddle shaped to give a nice standard action. I have a few more things to do on this guitar. I’ll post pictures of the bridge with strings on later. This entry was posted in workshop and tagged action, adjust, bridge, repair, tie-block. Bookmark the permalink.